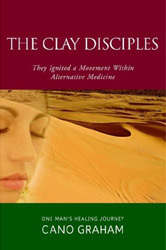 Our calcium bentonite clay is featured in the book "The Clay Disciples", written by Cano Graham. We are very pleased to be able to offer his book at wholesale prices. The Clay Disciples is an autobiographical chronical of one's man's discovery of the therapeutic value of clay, and his journey through life as he explores clay's curative properties. The pricing below includes free shipping charges anywhere in the continental United States. If ordering from outside of the U.S., please e-mail us for a quote. We also have non-profit rates available, contact us for details.